Hale Kai! Spectacular Oceanfront Home! 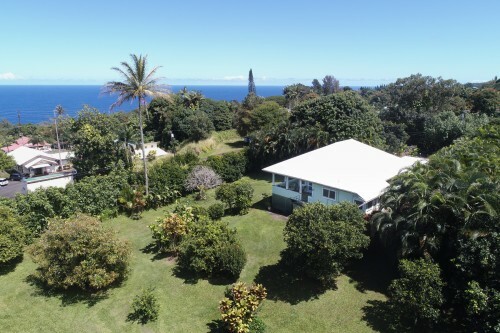 Spacious oceanfront home with spectacular panoramic view of the Pacific Ocean, Hilo Bay, and Honolii surfing beach. Hale Kai Hawaii is a well cared for home, ideally located for watching the sunrise. 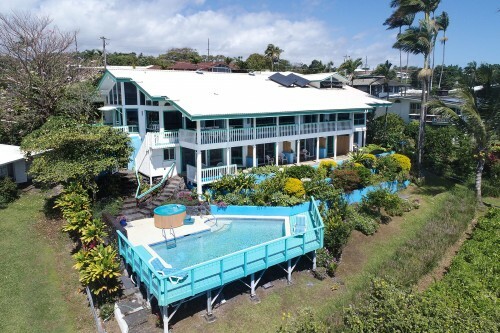 Spacious oceanfront home with spectacular panoramic view of the Pacific Ocean, Hilo Bay, and Honolii surfing beach. Hale Kai Hawaii is a well cared for home, ideally located for watching the sunrise, surfers, seasonal whales, dolphins and cruise ships. The neighborhood is quiet and friendly and just 3 minutes to downtown Hilo and 10 minutes to the Hilo Airport. The entry level provides a dramatic, sweeping ocean view from the open floor plan, with extended covered lanai. Plenty of room on the lanai for outdoor living, dining and entertaining. The main level also includes the master bedroom suite, complete with office area, walk-in closets, remodeled bath with large tub and walk-in shower, plus your own master lanai with amazing ocean and bay views. The huge ocean view eat-in kitchen has stainless steel appliances, stainless steel island, tons of storage and a separate laundry room. There's also a large bonus dormer room upstairs with full bath and bird's eye ocean view. Lots of possibilities for this great space - office, extra guest room, family room, or B & B manager's room. The lower level includes the 4 guest rooms, each with breathtaking ocean views, separate baths and access to the pool, hot tub and outdoor lanai area. The garden is always in bloom with several varieties of hibiscus, angel's trumpets, gardenias and fruit trees. Hale Kai Hawaii is a well established, fully permitted Bed and Breakfast, with a 28 year history, high occupancy rates, excellent reviews and many returning visitors year after year. This is a rare opportunity to live and work in Hawaii. All furniture, and furnishings and appliances in the guest rooms are included, as well as B & B inventory. Transferable warranty on appliances. Sellers will be available for your transition into this business. Come learn more about this incredible property. For info and pics sent instantly to your mobile device: Text "11162" to 79564. This is an oceanfront Hawaiian Garden of Eden! Rarely if ever do properties, even in Hawaii, combine so many desirable and unique features. With 530 feet of beautiful ocean frontage, including a spectacular black sand and pebble beach cove, this 3.8 acre parcel comprises two distinct sections - a lower lushly forested park area adjacent the beach cove and an upper bluff with stunning panoramic ocean vistas perched 25 feet above. Both sections are level and suitable to build on or leave just as they are. Thinking of building a retreat center or your dream home? This truly is the ideal parcel. Design a beach park set back from the shoreline, set up bamboo Hale dwellings with interconnecting walking trails meandering through the monkey pod, avocado, noni tress and lower foliage, sculpt a waterfall with ponds for quiet contemplation, build an activity center, or your dream estate on the upper bluff. With this property your imagination and the sky are the limits. With about 40 inches of rain a year compared to 80 inches two miles up the road, the weather here is sunny and perfect. This is the only parcel of land with over 500 foot of ocean frontage and beach cove remaining on the Puna Coast. The property is zoned RA.5 and can be subdivided to your specifications. Conservation land comprises the northern boundary of the property so privacy is guaranteed. A professional topological map is available and an archaeological and Historic Site study has been done that fully allows development and building. There is an installed county water meter, graded roadway connecting the lower and upper sections, phone and electricity available at the street - or go solar and bask in the FREE energy of sunny Kalapana. This is a secluded, beautiful and peaceful place, yet only 15 minutes to the great restaurants, shopping and farmer's market of Pahoa town, and 35 minutes to historic Hilo and famous Princess Lili'uokalani Gardens. For info and pics sent instantly to your mobile device: Text "7789" to 79564. Contact Donna Duryea for more information about this vacant land. Immaculately maintained and manicured ocean view home. Hear the sound of the ocean, watch the sunrise, moonrise, and whales and dolphins from spacious lanais on both levels. Mature and easy maintenance landscaping with a Song of India privacy hedge and rock walls that provide a buffer from the street as well as the salt spray. Great privacy for sunbathing, or relax and doze off to the sound of the surf. It's only a two minute walk to the coastline! The living room boasts a fabulous and irreplaceable Koa wood staircase and soaring vaulted ceiling. The living room opens to the dining area with covered patio for additional dining and enjoyment of the grounds. Just off the lanai is a delightful pond with a cascading waterfall and lovely tropical plants and fish. There's even a fire pit for occasional chilly nights. The kitchen is complete with corian countertops, an island with cook top and prep sink, pull up seating, a corner kitchen window, newer appliances and tons of storage - even a wine cooler. Enjoy lovely ocean views from each of the three upstairs bedrooms, all with access to the covered lanai. The master bedroom has a walk in closet and generously sized bathroom with Jacuzzi tub, shower and a skylight. Two additional upstairs bedrooms and second bath, also with skylight. The flooring throughout the home is tile and/or engineered bamboo, perfect choices for climate and easy care. Most furniture can be included. Newer 2 year old roof with 47 year warranty, 2 air conditioners, also with warranty. The neighbors are friendly and caring and it's a great and safe walking neighborhood. Not to mention it's the best weather on the planet! Lots of available outdoor activity with two nearby parks and mountain bike trails through the rain forest to sandhill trails. New Puna Kai shopping center is nearby in Pahoa town with its convenient stores and great restaurants. For info and pics sent instantly to your mobile device: Text "15120" to 79564. 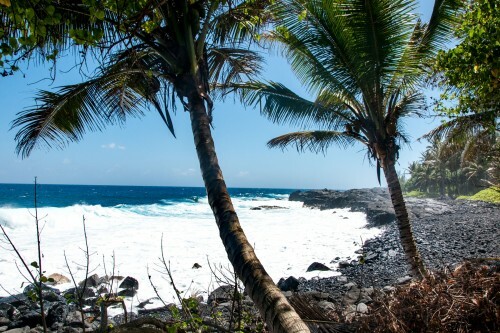 TRULY THE MOST SPECTACULAR OCEANFRONT PROPERTY ON THE ENTIRE EAST SIDE OF THE BIG ISLAND WITH OVER 15 ACRES PLUS AN UPSCALE PLANTATION STYLE HOME. 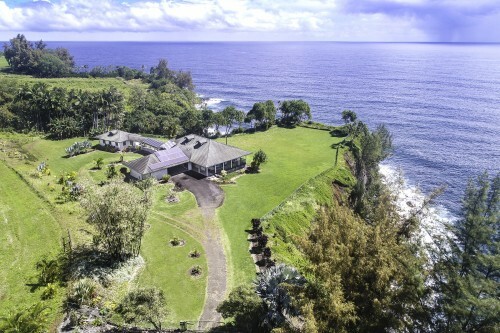 Views of Hilo Bay, Keaukaha, waves crashing against the ocean cliffs, open expanses of blue ocean, whales in season, cruise ships - this amazing property is unlike any you have seen on the Big Island. The home sits on 1 1/2 landscaped and fenced acres. The great room includes the kitchen, dining area and living room with solid oak floors and 9 foot ceilings with artfully placed ribbon mahogany trim. The windows are also trimmed with this same mahogany. The kitchen has granite counters, soft close "cherry" laminate cabinets with oak trim, top of the line appliances. The bathrooms have porcelain floor tiles and tub surrounds with pocket door entries. The master suite maximizes the panoramic ocean view, wake to the blue Pacific ahead with a glorious en-suite bath. The pantry/laundry room has a gas dryer, built-in ironing board, solar tubes, pull-out drawers and two tiers of shelves for extra storage. There is a sound system throughout the home as well as on the expansive covered lanai with individual volume controls. Internet is Hawaii Broad Band, T.V. is Dish Network. This home is "off the grid". It has 36 photovoltaic Panels which produce 6 KW of electric power, a 10 KW LP Generator, 2 inverters with 220 capability - all can be controlled from a wall panel inside the home. The home has passive air conditioning, Hardie Board siding, and an aluminum tile roof. The deck is constructed with IPE wood which never needs to be re-finished. The main home consists of the great room, laundry room, 2 bedrooms and 2 baths. The additional bed and bath are separate from the home and connected by a breezeway. The property includes 14 acres of pasture. County water to the house and water and electric at the top of the property. There is also a stream on the Hilo side of the property which ends in a 20 ft. waterfall into the ocean. Exceptional! For info and pics sent instantly to your mobile device: Text "96781" to 79564. A uniquely private setting surrounds this charming 1936 redwood plantation home that has been beautifully and lovingly refurbished with exquisite quality and taste. Ocean views of the blue Pacific from the lanai, living/dining room and master bedroom, with no houses or rooftops in sight! The home was thoughtfully restored to respect its historical charm, but fully updated and efficiently designed for modern living featuring a gourmet kitchen, three bedrooms and two full baths with a third bath underneath the home. The home features 10 foot ceilings throughout, coffered ceilings and handcrafted stain glass windows in the living/dining area and mud room, handcrafted leaded glass in the kitchen, and Art Deco touches reflected in bedroom door hardware and light fixtures. The gourmet kitchen’s high-end stainless appliances include Wolf gas stove top and double ovens, Sub-Zero French door fridge, Bosch dishwasher, trash compactor, wine fridge, and hot and cold filtered water. Marble-look quartz countertops, subway tile back splash, all wood white cabinets with contrasting peppercorn gray island cabinets, and white cast iron farmhouse sink make this kitchen a place you’ll want to be! Lots of counter space, storage and a counter height breakfast bar, excellent for prep space and seating. A spacious and completely private ocean and garden view lanai spans the length of the living/dining area. Two huge picture windows frame the view from the living room. The master bedroom has a walk-in closet with floor to ceiling custom closet organizer. The en-suite master bath has floor to ceiling marbled tile walk-in shower. Mature producing fruit trees include avocado, orange, lime, lemon, grapefruit, star fruit, mango and ulu, plus banana and pineapple and raised beds for planting. New electrical and plumbing in 2015. Full basement and double car garage with plenty of room for a workshop plus double carport. Located in Laupahoehoe, the heart of the Hamakua Coast. For info and pics sent instantly to your mobile device: Text "36122" to 79564. SPECTACULAR Ocean Front Property with Up.... Ocean View 1936 Redwood Plantation Home 10 Acre Kohala Ranch, Turn Key Estate Pr.... Charming and Custom Beauty on One Acre!